Earlier in the year, there were a few trees with catkins. We assumed would turn out to be Hazel. I’m pleased to report that, at least in this case, we were right. Did I mention that The Dog is quite fond of the Wild Cherries? She finds them on the ground and spits the stones out after she’s eaten them. She really doesn’t appreciate my excitement over the Hazel trees. Admittedly the nuts aren’t ripe yet. 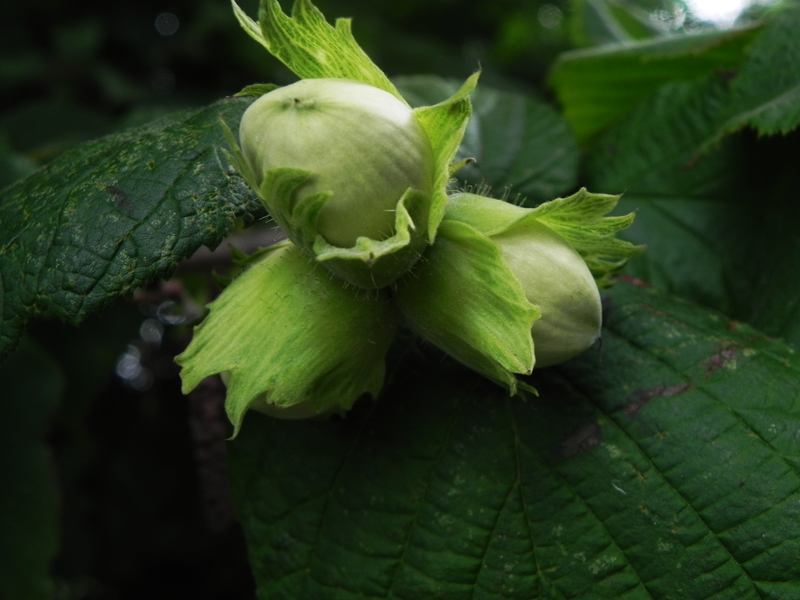 Seeking something of interest to pass on to you, preferably in a format that made it sound as if I had known it all along, I looked at what Google knew of the Hazel. He offered me a selection interesting snippets. In America, Oregon to be exact, they are expecting a good crop, slightly earlier than usual, this year. While, in the Upper Mid-West of that same Union of States, one Hazelnut producer has developed a device to shake the nut loose from the bits of tree that usually come with it, using a five gallon bucket, a few odds and ends and an electric drill. This combo does, in twenty seconds, what can take up to twenty minutes by hand. Somewhere (probably in Ireland but possibly on The Isle of Man or in Scotland) there is a lake with nine Hazel trees growing around it. They overhang the lake and the nuts drop into it enriching the water with all the knowledge in the world. If you should catch a salmon there, that tall, white haired guy that turns up and offers to cook it for you, is Finn McCool the mythical Celtic hero. I discovered Filberts or Hazelnuts on my property this year too! I think you need a salmon as well, before Finn McCool turns up. PS Glad you popped by, nice to see you.